Join us for an inside peek at some of the great hotel bathrooms we’ve recently visited in Europe and on cruise ships. Even though we travel extensively, we still remain wowed by great hotel bathrooms. Some have spectacular fixtures or designs, others stand out for their use of interesting materials or their great views. The porthole (overlooking the bedroom) of this futuristic bathroom was unique as were the egg-shaped toilet and bidet. At this hotel in the gothic quarter, the bathroom walls and floors made of quartzite stone sparkled. In this two-level, one-bedroom residence, the glass shower in the round could fit at least six people. It connected the oversized bathroom, which was split in half for him and her. The breathtaking bathroom in this incredible suite offered views of the Eiffel Tower. With Hermes toiletries and soaps, this bathroom actually was comprised of two separate marbled rooms. This is the one that housed the toilet and bidet. The marbled bathroom in this beautifully restored Art Nouveau building has an art deco feel. Art work in the loo? We loved the picture of this bather in the separate lavatory. 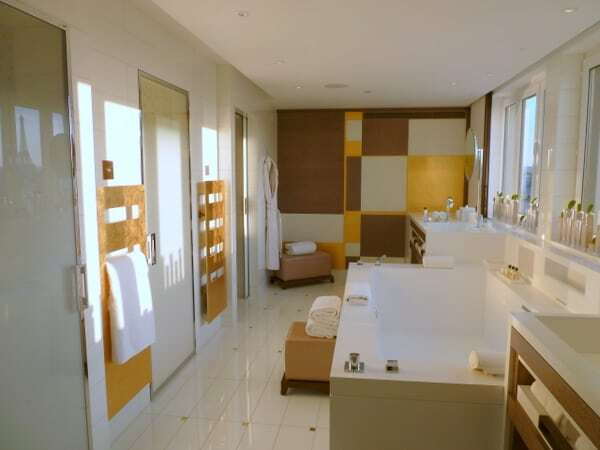 The bathroom in our penthouse suite had double sinks, triple mirrors, a separate Jacuzzi and stall shower and lots of light. We especially loved the ample drawers and shelf spaces to stow our toiletries. Our penthouse cabin had a full-size bath, separate stall shower (with a rainshower head), and his-and-her medicine cabinets stocked with Bulgari toiletries. See Part II with Great hotel bathrooms in Mexico, the Caribbean and Africa. Do you swoon over great hotel bathrooms as much as I do? *This post was inspired by the Notable Restroom Series by Elizabeth Rose. You can take a peek at some of her unusual finds on her blog, Travel Writer Rants and Raves. This is my kind of article! So jealous. MY shipboard bathroom was extremely compact — certainly not big enough for two! Riverboat or cruise ship, Helen? Great bathrooms, for sure. I was quite impressed with many of the bathrooms – even at gas stations – in Italy. The tiling was gorgeous and all were spotless. It was an incentive to redo two of our bathrooms at home which we recently completed. They’re gorgeous now (although still can’t compare with the photos of those places you stayed at), but to us, ours are truly beautiful now. We went with all-modern, tiles up to the ceiling, imported sink/vanity that hangs on the wall, etc. Funny thing is that those who visit never seem to comment – except for one of our sons who thinks the modern faucet is too far out :). But we love it and that’s what matters. After seeing these, Arline, I can totally relate to wanting to redo our bathrooms at home. I got such a kick out of this story that I shared it on my Restless Voyager FB page. It was truly unique – and entertaining.